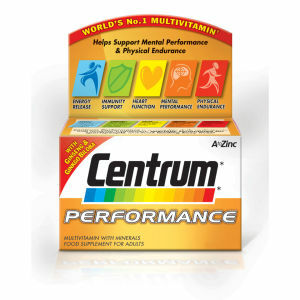 Centrum Advance Multivitamin Tablets are perfect for those with on-the-go, busy lifestyles that mean it isn’t easy to maintain a completely balanced diet, delivering essential vitamins and minerals to supplement your nutritional needs. The world’s number one multivitamin is established through 30 years of scientific research and nutritional expertise, combining 25 key nutrients with all 13 essential vitamins to support vitality and immunity while contributing to normal vision and heart health. B Vitamins help to release food-based energy for an overall boost, plus Vitamin C supports the immune system and increases antioxidant levels. Vitamins A, C and Biotin maintain healthier looking skin, while Calcium improves the normal function of digestive enzymes to enable a normal metabolism. Feel at your best with the quick and easy-to-take daily food supplement. Free from gluten, azo-dyes and wheat. Multivitamins are intended to supplement your diet and should not be regarded as a substitute for a varied diet and a healthy lifestyle. Save 33% on selected Centrum products.